With the increased availability of medical marijuana in a number of different states, it’s only natural that patients who suffer from conditions like Crohn’s disease would want to try it out as a form of treatment. Some are especially eager now that research is showing that certain compounds in the cannabis plant have therapeutic benefits for the symptoms associated with the condition. With all that said, experts urge individuals to proceed with caution when considering this alternative, because there’s no imperial evidence to conclude the connection between Crohn’s and medical marijuana. The Israel Medical Association Journal published a study in 2011 which featured 30 patients who weren’t responding well to conventional treatments. After being given marijuana as an alternative treatment, all the participants reported significant improvements in symptoms and an increased quality of life. Another study which was published on the Clinical Gastroenterology and Hepatology Journal in 2013 featured 21 patients who were split into two groups, with one group given a treatment of THC-rich marijuana cigarette, while the other was given placebo marijuana cigarette without any THC. After two months, the patients in the THC group reported significant improvement in symptoms while the placebo group didn’t. What’ interesting to note about this second study is that it also tested the participants’ C-reactive protein (CRP) inflammation levels before and after the trials. The results showed that both groups didn’t experience any improvement in this area, which is the root cause of Crohn’s disease. As such, experts argue that there simply isn’t enough evidence to verify that cannabis is an effective treatment for Crohn’s. 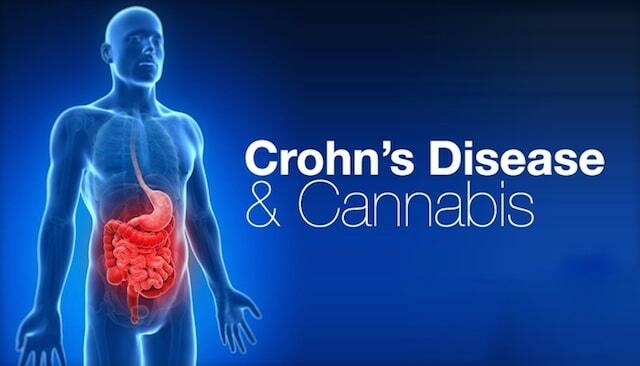 One of the leading risks of marijuana use in Crohn’s patients is that the improvement of symptoms may cover up the presence of the inflammation that’s causing the disease in the first place, thus giving patients a false hope regarding their condition. Other experts also suggest that long-term use of marijuana to treat Crohn’s symptoms may lead to addiction, psychosis and even neurocognitive damage. That’s why it’s mainly recommended for patients whose condition no longer responds to conventional forms of treatment. The good news for Crohn’s patients seeking marijuana as a remedy for their condition is that medical marijuana is now legalized in 28 U.S. states. However, it’s important to consult with your physician first before you try any form of treatment, including marijuana. That way, if your doctor approves you for cannabis treatment as the best treatment for you, he or she can provide you with a certificate to obtain it legally and at the right dosages from a registered dispensary. Keep in mind that your doctor has to be registered with the medical marijuana program of your particular state in order to “prescribe” marijuana as a treatment for you. If not, then you can ask them to refer you to a doctor who does comply with these conditions.